Teena and I both enjoy history, especially local history, so what could be better than a walk through Exhibition Place learning about the American invasion of York back in 1813? Not only is this the history of the War of 1812, and the history of Toronto (then known as York) but all the events of April 27, 1813, basically took place in the backyard of where we live. 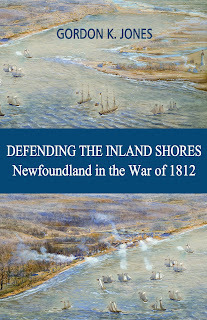 I do quite a bit of reading about the War of 1812 and, although there is a lot that I don't know, I have always believed I could map out most battles of the war, especially the invasion of York. But today I learned that as time rolls on, new evidence can change what we thought we knew of history. Tonight Steve Collie of Heritage Toronto Walks changed what I knew of the Battle of York. The walk was free and more than 200 people showed up, which I was very pleased to see. People care about the history of this city! 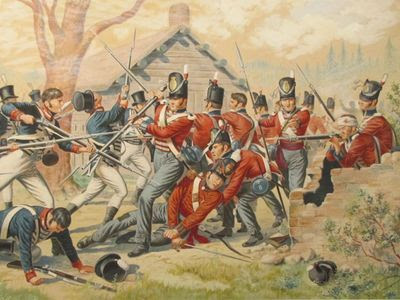 April 27, 1813 was a traumatic day in Toronto's history. At 8:00 am, over 2,000 American soldiers landed just west of present-day Exhibition Place. By 2:00 pm the battle was over and they had control of the town. Walk the route taken by the Americans as they advanced on Fort York and hear about the skirmishes and some of the new research discoveries about the battle. Steve Collie was an excellent guide. He was knowledgeable, very knowledgeable on the subject without being a bore, interesting and had a good sense of humour. The walk took a little longer than planned as it takes longer for more than 200 people to move from one spot to another. I never had a dull moment. Much of what I thought I knew of the battle has now been proven wrong over the past 5 to 6 years. Collie even mentioned that facts about the battle were changing so fast with so many people pouring through archives on the war now that the 200th anniversary of the war was being commemorated, that he has been constantly changing his notes of this tour, one he has led many times before, just as recently as a few months ago. Changes? When I first read about the battle, I heard the Americans landed by High Park. Then that changed to them landing closer, to about where the Boulevard Club now stands. Tonight I learned the Americans actually landed in clearing at the west end of the Exhibition grounds by the Liberty Grand. More surprising is that I always thought the battle was more of a running retreat, where a line of troops fire and fall back behind another line that fires and falls back. Tonight I heard the British Forces rallied and had two pitched battles, one where the ruins of Fort Rouille stand and another by where a bridge now crosses Lakeshore Boulevard. I would recommend a Heritage Toronto tour to anyone. The are well organized, and well run. We have another walk with heritage Toronto again on Sunday! Our troops first organizing, then following the path of battle. A fanciful painting of popular British officer Captain Neal McNeal at the American landing.